DIS yeLo Nvlope iz @wsum! Remember those AIM days where we could actually understand that lingo? If you weren't from those days, or just don't want to even try (we don't blame you), we just said "This yellow envelope is awesome!" Either way you type it, it's the truth! AIM’s yellow running man logo inspired the color to go viral, even ironically to a point of taking it back to these policy envelopes! Yes, envelopes - they still exist and are still prevalent. Use our #14 envelopes for the assortment of AIM names you used to have that you want to keep forever, or those crazy away messages you want to save for life. Like this one you definitely had: oMg @ JAM buyin' sum kewl papurrrrrr. bRb! By the way if AIM was still prevalent, JAM's Paper & Envelope screenname would have been xxjamminxxpapurrxx55. Isn't it @wsum? Yellow #14 Envelopes measure 5 x 11.5. 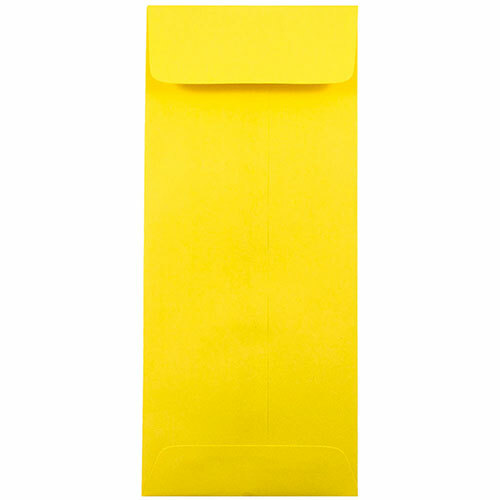 Yellow #14 Policy Envelopes open on the short side and are made from Yellow Brite Hue Recycled.